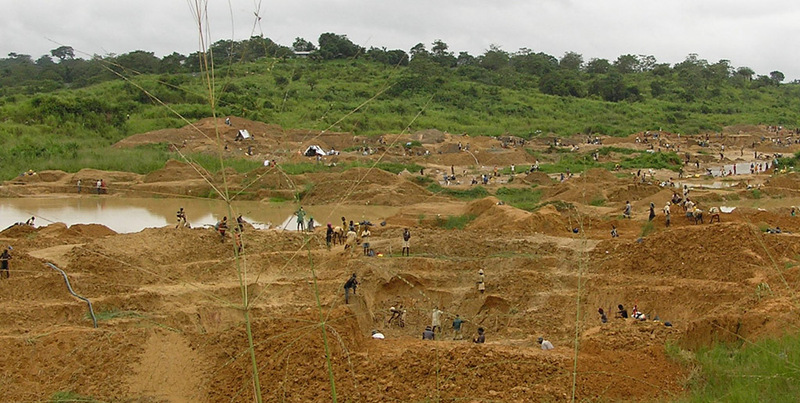 Small scale diamond diggers, as shown here, often live on less than two dollars a day. A few nights ago I streamed The Ambassador on Netflix, watching the film while hanging out at my home with my friend/gem supplier and newly minted movie star, Guy Clutterbuck. I had watched the film when it came out about a year and a half ago and wanted to see it again with Guy. In the movie, Lars Von Trier buy a Liberian diplomatic passport for tens of thousands of dollars and then travels to the Central Republic of Africa (CAR) where he meets with officials from that country in order to smuggle diamonds. Here’s the trailer. The film, which came out in 2011, runs like an ironic B-movie. A bald headed Danish guy wearing white linen, high leather boots and designer sunglasses wanders through tragically drunk pygmies, trying to build a match stick factory as a cover for his black market diamond business, supported by various government officials. Initially, some critics called it a mocumentary; in fact, it is a hard hitting documentary. Guy, who has done gemstone business in Africa for over twenty years, pointed out that part of the tension in the movie is that events could easily turn bad, given what Von Trier is attempting to do. He could have easily ended up dead. Since the movie came out, in March, 2013, CAR’s President, Francois Bozize, was overthrown by a rebel group. The CAR of the one of the top five diamond producer countries in the world. It was not until June of last year that the Kimberley Certification Scheme (KPC), which is supposed to assures a “conflict free” supply chain was suspended. Regardless of whether CAR is part of the KPC or not, the diamonds produced in this country will find their way into the supply chain and be certified as “conflict free.” The diamond supply chain is corrupt and the jewelers that back it by calling their stones “ conflict free ” support that corruption. Unfortunately, the corruption of the diamond trade extends far beyond what just the CAR. Blood diamonds from Zimbabwe now legitimately enter the supply chain and can be sold to customers as conflict free. In fact, the United States is at the center of the illegal diamond trade. Though Africa needs its diamond trade, the only traceable diamonds from Africa are through the De Beers supply chain. Therefore, for those who want diamonds, we recommend two options: Canadian or those that are “recycled” from old jewelry. As for the film, two thumbs up. It will give you good insight into the diamond sector and how things work in a corrupt African country.